The saying goes, “ I’d rather be lucky than good”. At the time, moving to Long Island from the northwest mountains of Sussex County, New Jersey seemed depressing as a bow hunter, or so I thought. I had no knowledge of the caliber of whitetail deer or the amount of people that reside here. So many great deer have been harvested from here and still are, each and every year. 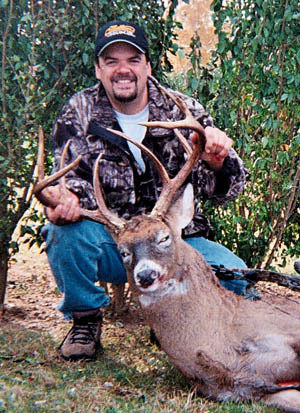 The combination of thick pine tracts and huge private estates on the south fork tend to let deer age and give ample opportunity at a mature whitetail to a hunter if he or she is granted access. Truly suburban hunting. My electrical contracting business introduced me to the farms and vineyards of the north fork of Long Island where I now call home. In June of 2001, a call came into the office to bid on a new construction site in the Town of Southold. After the on site meeting, I chose to take a walk along the railroad tracks adjacent to the project which led me to a cat tail swamp along the bay. Immediately I could see deer were using the cat tails and waterway as cover to make it to another finger crossing into a small woodlot. This was a hunter’s “Holy Grail” because of the geographical layout and nature of the surroundings. A hidden gem, very recluse. As I investigated further, I found a unique 5-point shed with a bladed and curved G1. I could not believe it! It was truly my first big shed. This buck was alive and made it through not only the previous hunting season, but also the rut, he avoided vehicles, and people. The next opportunity I had, I searched the area for hours and to no avail, I never found the left side shed, however it was evident the deer were still there. Next was a plan to obtain permission to park, find a remote way to get a stand site, locate a few trees to climb and hopefully get a glimpse of the shed’s owner. With permission granted, my annual trip out west to Illinois prevented me from getting to the area until November 9th. I really had not gone back since looking for the matching side and had no idea what was about to happen. I was settled in by 3:00 p.m. and enjoyed the sights and sounds for the next few hours. Suburban hunting sounds, leaf blowers, traffic on the main road, seagulls and the last train of the day. The sights were much better, a few does and a small buck. With light fading a doe ran across the railroad tracks, I could hear her hooves on the rocks along the rails. Alert as ever, I stood and watched, thinking she was spooked by the train. Then a large buck appeared. With a very short grunt, the buck stopped and then attempted to get down wind of me. How dare a intruder be here, in his lair his posture stated, after all he is a mature buck and has used this area for a few years now without being discovered. I stopped him at 35 yards, anchored and shot. The adrenaline overwhelmed me. Unsure of the exact hit, I immediately became upset with myself. Did I hit him where I was aiming?, Am I going to lose this deer? Was it too far back? One of many thoughts that go through a bow hunters mind when the animal doesn’t fall within sight. Looking back, the climb down was not safe, I think it was more a slide! Find blood, or the arrow, something... "Be quiet", I told myself. After marking my back trail and finding some small specs of blood I could tell the hit was marginal and I was upset with myself. I knew however, I should leave and come back in the a.m. Then it happened, a crash in the dark woods. Did he hear me? Did he see my light? I didn’t know, I might have just blown it. Feeling sick I might loose this deer, the night was short and I was back way before first light. Picking up my markers, I made my way back to last blood. On hands and knees, there were only drops, which led to bigger and better sign. Not twenty yards from my mark from the night before, the buck laid down. It was then I realized it was him that crashed, not far from my last mark. I deperately wanted to look for the entrance wound. All along, I believed I hit him broadside, slightly quartering to me, however, I was to find out the truth. To my disbelief, the Muzzy tipped arrow entered the front, right lower leg, exited the backside, entered the lower chest and took out the heart. He was quatering much more than I aimed. Without question, both of the bladed and curved G1’s on this deer proved that the shed I found in June where his. Simply amazing character. This hunt was truly a “ right place, right time” hunt. You could also say I was pretty lucky. I’ll take luck over being good….anyday.